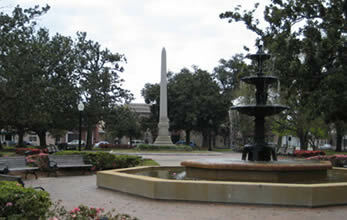 Plaza Ferdinand VII, the site of the formal transfer of West Florida from Spain to the United States in July 1821. Plaza Ferdinand VII, a National Historic Landmark, is the site of the formal transfer of Florida from Spain to the United States in July of 1821. The basis for the transfer was the Adams-Onís Treaty of 1819, also known as the Transcontinental Treaty, whereby Spain agreed to cede East and West Florida to the United States in exchange for the United States agreeing to pay its citizens’ claims against Spain up to $5 million dollars. While it took Spanish foreign minister Louis de Onís two years to sign the treaty with Secretary of State John Quincy Adams, he ultimately realized that he had to negotiate with the United States or risk losing Florida without any compensation. Spain finally signed the treaty February 22, 1821. On July 17, 1821, in Plaza Ferdinand VII in Pensacola, Florida, Spain formally transferred Florida to the United States. Well before the Adams-Onís Treaty, many European powers sought control over the land that would one day become the State of Florida. During the 1500s, early Spanish explorers such as Juan Ponce de León, Hernando de Soto, and Tristán de Luna y Arellano, helped to identify Florida as a desirable place for explorers, missionaries, and treasure seekers. In 1513 when Ponce de León arrived on the sandy shores of Florida for the first time, he named the area la Florida, in honor of Pascua Florida (“feast of the flower”), Spain’s Easter time celebration. 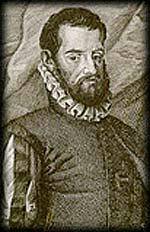 After the early explorers’ failed settlement attempts in Florida, Spaniard Pedro Menéndez de Avilés established a permanent settlement, named San Agustín (St. Augustine) in 1565. St. Augustine was the first permanent European settlement in what is now the continental United States. For the next couple of hundred years Spain continued its colonization efforts, constructing forts and Catholic missions throughout Florida. During this time both the French and British attempted to take gain control of Florida from Spain. Like the Spanish, these nations sought to exploit the rich resources of the area. For the most part, Spain was able to ward off these attempts; however, continued attacks by both France and England throughout the 1700s revealed the growing weakness of Spain’s hold on Florida. During a brief period, from 1763 until 1784, the British gained control of Florida. The British split Florida into two parts: East Florida, with its capital at St. Augustine; and West Florida, with its seat at Pensacola. The Spanish regained control of Florida in 1784 as part of the peace treaty that ended the American Revolution. During the second period of Spain’s control of the area, Spanish colonists, settlers from the newly formed United States, and escaped slaves all fled to Florida. Favorable Spanish terms for acquiring property drew settlers. Escaped slaves came to the area because here their U.S. masters had no authority over them. During the early 1800s, while Spanish Florida was actually becoming more “American,” Spanish resources increasingly dwindled due to war. Spain was losing its hold on its American empire. While Spain had long rejected repeated American efforts to purchase Florida, by 1819 the idea of ceding it began to make sense. Florida had become a bit of a burden to Spain, which could not afford to send supplies, settlers, or soldiers to protect Spanish settlers in this faraway land. While it took some time for Spanish foreign minister Louis de Onís to get the treaty ratified that would transfer rule of Florida to the United States, he ultimately realized that Spain had to negotiate with the United States or risk losing Florida without any compensation. Spain formally ceded Florida to the United States under the terms of the Adams–Onís Treaty with the signing of the treaty on February 21, 1821. By March 1821, General Andrew Jackson received the appointment of temporary governor of both East and West Florida, which were to be combined into one territory. In July of that year, Jackson sent Colonel Robert Butler to serve as his representative in accepting the official transfer of East Florida at St. Augustine, and he proceeded to Pensacola to accept the official transfer of West Florida. On July 17, 1821, in the third and most important transfer ceremony, the official transfer of West Florida to the United States occurred in Plaza Ferdinand VII at Pensacola. This ceremony was especially significant because it was the only one in which the Spanish territorial governor participated and because immediately after the ceremony an official proclamation announced the transfer to the United States and the establishment of its territorial government in Florida. The transfer ceremony began around 10:00 am when Jackson rode to the steps of the Government House, which was on the site of the present City Hall, and met Spanish governor and colonel Don José María Callava. Together the men descended the steps and entered the plaza where they walked between lines of United States and Spanish troops. While the Fourth Infantry band played “The Star-Spangled Banner,” the Spanish flag was lowered to half-staff and the United States flag was raised to a level with it. Soldiers lowered the Spanish flag and raised the United States flag to full staff while the U.S.S. Hornet in Pensacola Bay fired a 21-gun salute. 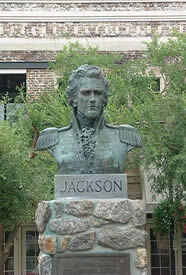 After the ceremony, Jackson officially proclaimed the establishment of the Florida territory, and a few days later, he set up a new territorial government on behalf of the United States. Today, visitors and residents of Pensacola can stroll through the plaza where this historic event occurred. The Pensacola Historical Society erected a commemorative monument in the plaza in 1935, and old cannons are mounted at the four corners of the plaza. The plaza is bounded by Government Street, Jefferson Street, Zarragossa Street, and Palofax Street. Historic Pensacola Village, a collection of 22 historic buildings and museums where visitors can take self-guided walking tours or guided house tours, surrounds the plaza. Plaza Ferdinand VII, a National Historic Landmark, is bound by Government, Jefferson, Zarragossa, and Palofax Sts. in Pensacola, FL. Click here for the National Historic Landmark file: text and photos. The plaza is open year round, 24 hours a day. For more information, visit the Tourism Division of the Pensacola Bay Area Chamber of Commerce website or call 800-874-1234.